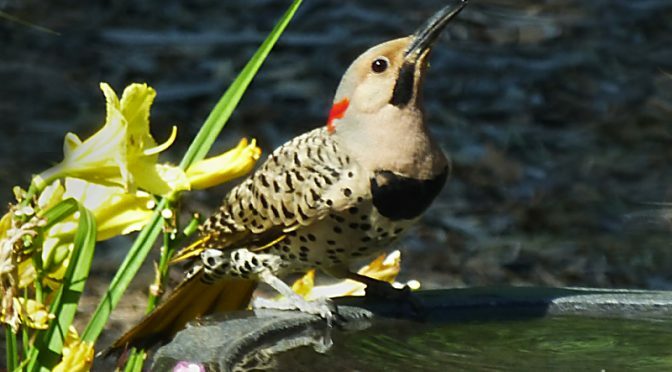 I was out in the yard early this morning when I heard the call of Northern Flickers everywhere. I looked up in the tree and there were 5 of them… 2 adults and 3 smaller ones,. They looked too big to be chicks but they were all hanging out together so maybe they were parents and chicks? The small ones were pretty big, but Northern Flickers are pretty big too. They were bantering back and forth and flying back and forth for a while when this smaller one landed on our birdbath for a drink of water. He’s just beautiful, don’t you think? Maybe they were waiting for his review of the Tulin resort and spa with bountiful buffet?